Take a hike. Seriously - your phone will stay charged even when you're miles away from the nearest outlet. Get the Universal Waterproof Solar Charger from Mobile Kingdom for $13.99 at Escapist Deals. Choose from black, blue, green, or yellow. 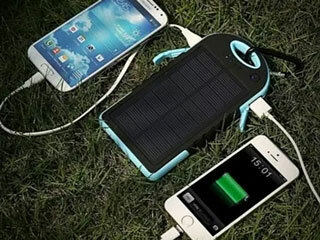 Whatever you go for, this 5,000mAh charger will power up your phone using the sun's energy, giving you backup battery power in the middle of your outdoor adventures. And if things get really adventurous, don't worry - this baby's waterproof and shockproof. Use the mountaineering clip to attach it to your bag and head out - it'll charge your Android and your iPhone. Get the Universal Waterproof Solar Charger from Mobile Kingdom for $13.99 at Escapist Deals.